I continue my Zen in one of the most opulent relaxation rooms I’ve had the chance to chill in. Dripping in rich brocade red velvet chaises, heavy curtains and Asian art I feel like a Balinese princess as I sink into the sofa and drink in the view of the large infinity-edge pool. At night the pool is lit up with a series of floating lights giving it a magical feel. For couples, booking one of the six private spa suites is a romantic way to go. 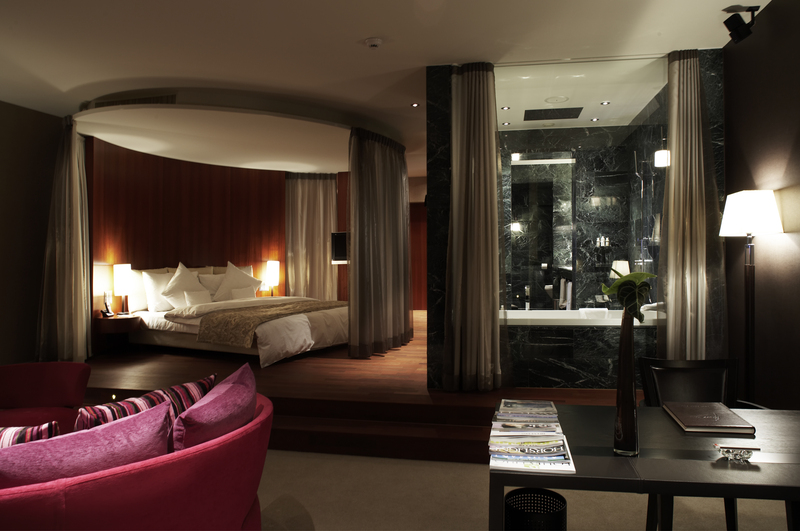 Each suite is named after a gemstone and employs the property of the stone. Obviously, you should reserve the rose quartz room featuring a whirlpool, sauna and Kneipp pool. It hums with the stone’s energy to bring love and romance. Every suite also includes shower facilities, waterbed, tanning bed and entertainment system. Of the several spa suite-specific packages that are available, I like the Sparkling Romance that includes a bottle of Perrier Jouet champagne. 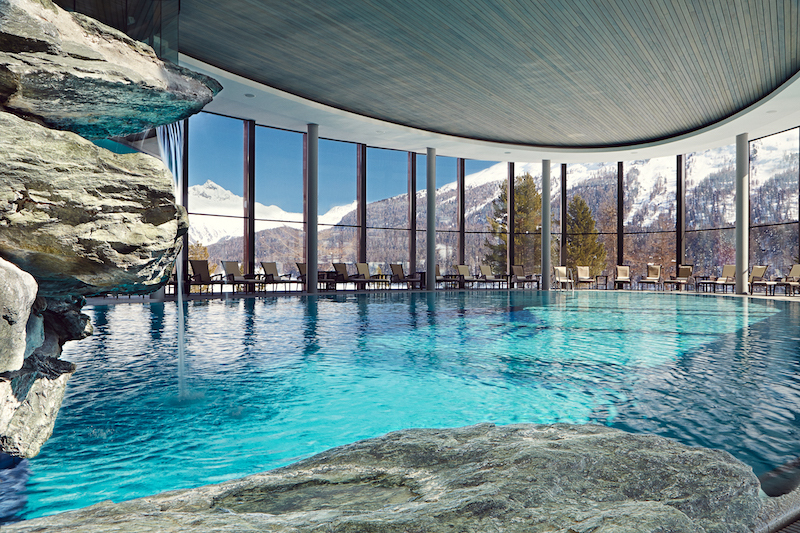 While it’s not a designated wellness region, St. Moritz offers plenty for the wellness jet-setter. It may only have a population of about 5,000 and a compact village center, but what it lacks in size, it makes up for in glitz. Known for great skiing and a social see-and-be-seen playground for the rich, St. Moritz is the most cosmopolitan of mountain towns. Stroll down the Via Serlas and you’ll find outposts of every luxury fashion brand like Hermes and Bottega Veneta, along with local shops like the family-run Lamm boutique selling all things cashmere. I arrive at the train station and I’m picked up in a vintage Rolls Royce and whisked to the famous Badrutt’s Palace Hotel, the most iconic five-star accommodations in town. As I look around the lobby at my fellow guests, I realize I’m in the land PETA forgot, as nearly every woman I pass has a fur coat, fur vest, or even fur boots. I feel severely undressed. The 122-year-old hotel ushered tourism into the area when it first opened, and today it is still the top pick for celebrities and A-listers when they come to town. I’m going to earn my time at the spa this time, spending the day on the slopes. 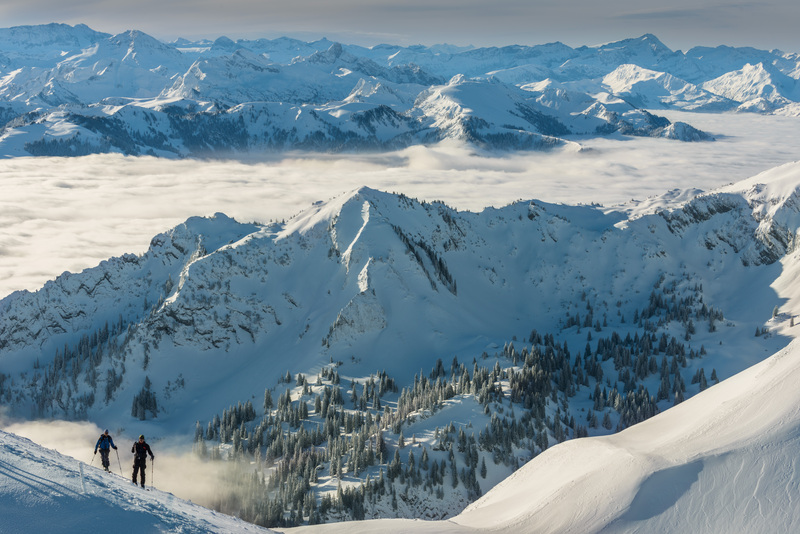 While skiing in the Swiss Alps is a check on my bucket list, I have only skied one other time, so I book a private instructor through the ski school at the hotel. I meet Nadine to get outfitted, and we discuss the plan for the day. 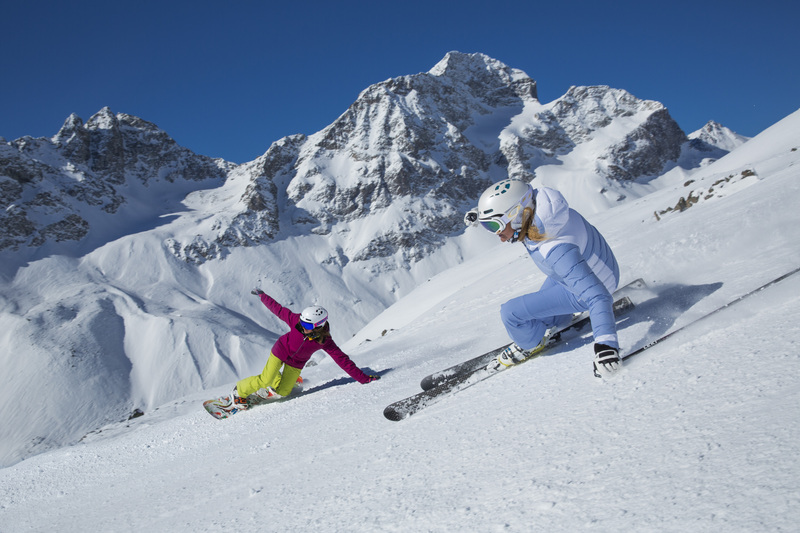 Thankfully, the famous local mountain, Corviglia, offers runs perfect for rank beginners to Olympians. In fact the mountain hosted the FIS Alpine World Ski Championships this year. Bucket List! Ski the Alps! Nadine appropriately starts me in the children’s area to review the basics of skiing (French fry and pizza!) and to get my ski legs back. We spend the morning going over technique and gliding down slopes that I’m not even sure rise to the level of a green run. Four- and five-year-olds whiz by my ankles. In the afternoon we graduate to actual skiing and tackle a few of the easy runs. I remember now why I enjoyed skiing so much the first time I was on the slopes five years ago. I start out tentatively, but soon realize it’s actually easier to build up a little speed and let the skis simply run and flow. After hours on the slopes, I’m grateful to end the day at the Palace Spa, indulging in the Après Ski massage. I’m hoping the sports massage will ease the sore muscles I expect after a day of skiing. My therapist Fabio (no joke) is putting so much effort into deeply kneading my muscles, that he’s breathing heavily and grunting throughout the service. I think he’s getting as much of a workout as I got on the slopes! While not relaxing, the massage does the trick, and I wake up the following day with only a minor feeling of tightness. Post massage, I head for the Palace’s indoor/outdoor pools. The heated outdoor pool with its steam rising and jaw-dropping view had been beckoning, and my only concern was having to get out of the pool outside–but close-up I see the most ingenious design ever. The indoor and outdoor areas are connected and a glass partition rises to move between the two, allowing me to enter and exit into the heated indoors. Relaxing in the outdoor pool was one of my favorite moments of the trip. The spa facilities also include an aroma steam room and a salt steam room, a mist room, ice room and a sauna. What makes the sauna unique is that a blend of local herbs and rose oil scent the space. It smells better than any sauna I’ve ever been in. 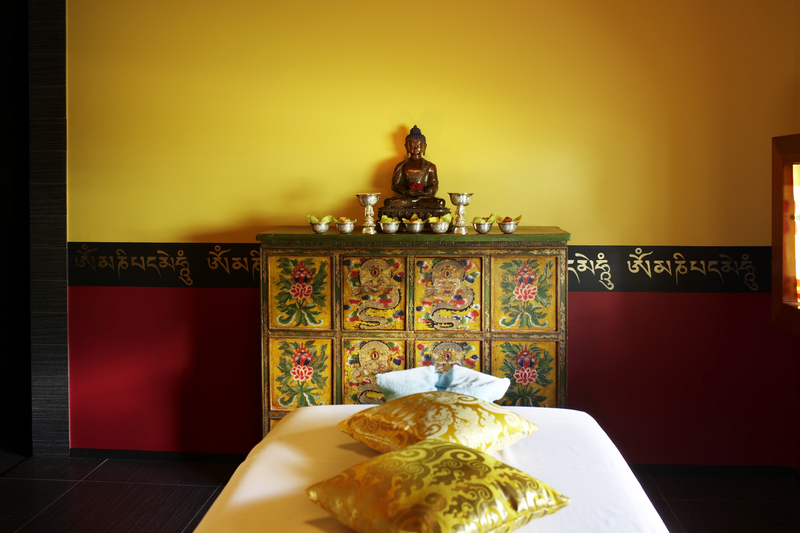 My Swiss wellness adventure ends in Zurich, with a stay at the boutique Hotel Marktgasse. The 39-room, recently renovated historic property is in the heart of Old Town and made last year’s prestigious Hot List by Conde Nast Traveler. While the small hotel doesn’t have its own spa, it offers guests complimentary access to The Fitnesspark Hamam Munstergasse, a two-minute walk away. Not only do I have access to the gym and group fitness classes, I get to use the Hamam, the oldest one in Zurich. I haven’t had the pleasure of visiting a Hamam in the Middle East so this was the most extensive Hamam I’ve experienced. As it was located in a gym, I was surprised by the luxurious and lavish design and décor. Like a traditional Hamam, this one is meant to be both a place of relaxation and a social gathering hot spot. There is both a coed Hamam and a female-only area. The Hamam follows a prescribed ritual of different stations. I’m given a pestemal (big Hamam-towel) to wear, so no swimwear is needed, nor are you naked. I’m also given a kurnas (copper basin) and kese (peeling glove) to use throughout the circuit. The Hamam experience takes about 90 minutes if you follow the prescribed length of time in each room. I start with the Sogukluk, which warms me up in an herbal steam room before heading to the Kese/Lif to use my kese to exfoliate. The Sicaklik is a beautiful central bathing area in which to relax before heating things up in the Bingul, another herbal steam room. The ritual winds down with a rest on the umblical stone before heading to the Camekan, a relaxation area with tea, magazines and groups of friends quietly chatting. Wellness options abound in Switzerland, and this summer I’m excited to return to check out the new Burgenstock Resort in Lucerne. 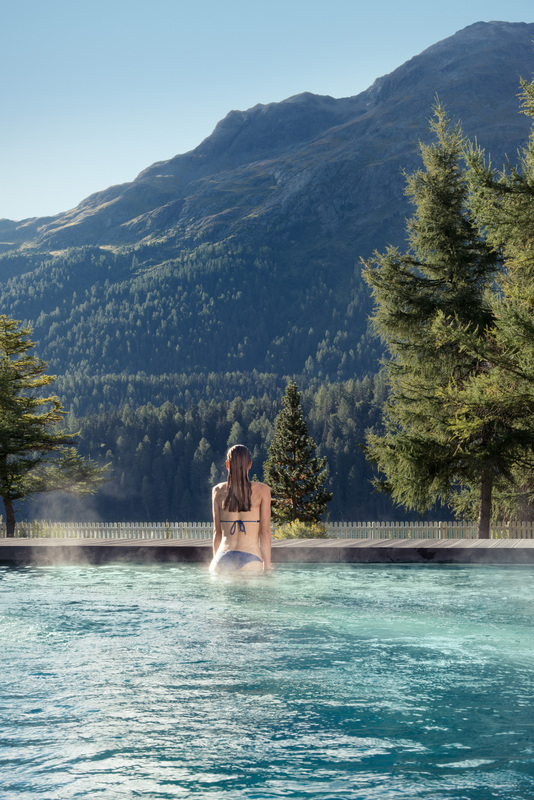 The historic resort village is reopening in September with the Waldhotel, a dedicated five-star wellness hotel and the Burgenstock Hotel & Alpine Spa. Together the two properties spas will combine to create the largest spa offering in the world.